Dams are required in most hydraulic systems, for irrigation, regulating flow of rivers and in modern times for the production of energy. In the classical Islamic world, dam construction received a special attention as an integral part of large civil engineering works. Since the Umayyad Caliphate, dams were built in different Islamic regions. This article is a survey presenting the tradition of dam construction by Muslims, characterized by a rich variety of structures and forms. Note of the editor: This article has been published on Muslim Heritage in December 2001 in PDF format. We present it to our readers in a new editing in HTML, with illustrations. Historians of civil engineering have almost totally ignored the Moslem period, and in particular historians of dam building, such as there have been, either make no reference to Moslem work at all or, even worse, claim that during Umayyad and Abbasid times dam building, irrigation and other engineering activities suffered sharp decline and eventual extinction. Such view is both unjust and untrue." A similar point is raised by Pacey, who notes that it is often said that hydraulic engineering ‘made little progress under the Muslims’, and that the latter’s achievements hardly evolved beyond the Greek or Roman’s. Pacey corrects this view, pointing out that the Islamic civilisation adapted ancient techniques ‘to serve the needs of a new age’, and that the Muslims extended the application of mechanical and hydraulic technology enormously. Explaining the reasons behind the belittling of Muslim achievements, which has been noted by Smith, Pacey and others, is a mammoth a task much beyond the scope of this article. 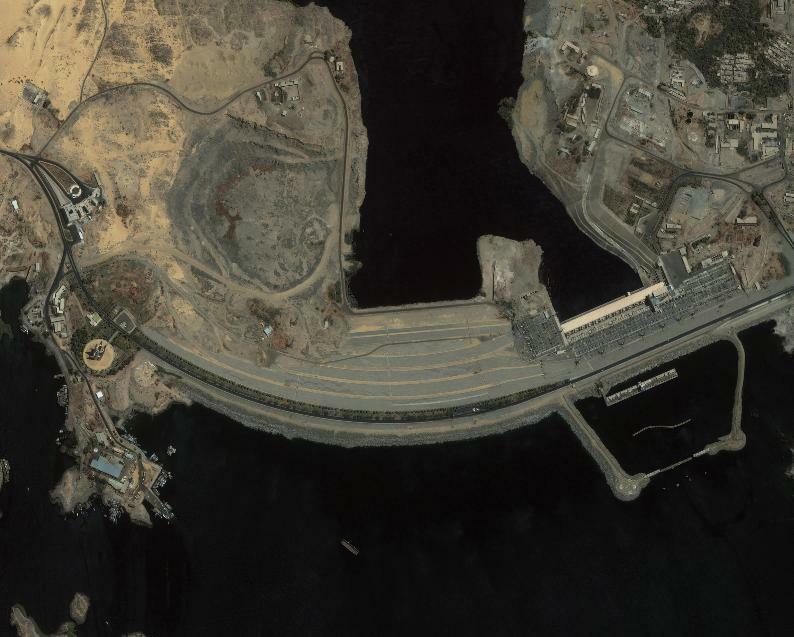 Figure 1: Satellite view of Aswan High Dam in Egypt. Completed in 1970, this gigantic dam was one of the largest earthen embankment dams in the world. It is 111 m tall, 3830 m long and nearly 1000 m wide. Its construction has had immeasurable impacts on the Egyptian economy by regulating the Nile river flooding, providing storage of water for agriculture and for generating electricity. (Source). Muslims, as the following essay will explain, built such dams for a great variety of reasons, including economic, social, and also as Welch remarks in relation to the Tughluq princes of Muslim India (beginning1320...) their patronage not only made sound economic and military sense but also served to demonstrate piety and their concern for those they ruled. Among the gifts which God bestowed upon me, His humble servant, was a desire to erect public buildings. So I built many mosques and colleges and monasteries that the learned and the elders, the devout and the holy, might worship God in these edifices, and aid the kind builder with their prayers. The digging of canals, the planting of trees, and the endowing with lands are in accordance with the directions of the Law. Dam construction became part of a grand plan or strategy as is best obvious in Muslim India, indeed. Ghiat al-Din Tughluq's short reign (1320-1325) was dominated by successful efforts to resist Mongol and Chaghatai invaders from the north and to establish firm control over the Delhi Sultanate. Central to these policies was the massive military complex to the south of modern Delhi that is dominated by the great fortress of Tughluqabad, reportedly completed during the sultan's reign. Tughluqabad's huge walls extend for six kilometres, but the bastion is part of a larger complex including the adjacent smaller fort of 'Adilabad (perhaps built by his son Muhammad) 350 metres to the southeast, a third fortified structure now referred to as the Nai-ka-kot a short distance to its east, and an elaborate network of dams and sluice gates that was integral to the whole defensive scheme. Tughluqabad sits in a large plain that during the monsoon was transformed into a shallow lake. Otherwise, there is no natural water source of any significance. (Today the land around Tughluqabad has become a major focus of urban development and suffers from a chronic water shortage.) 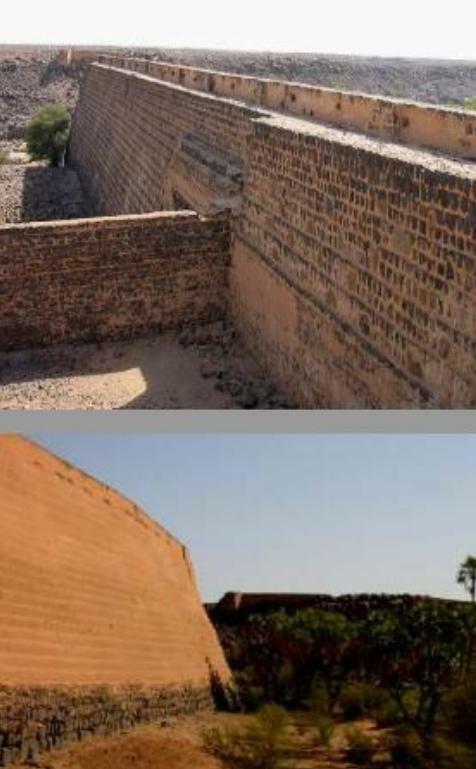 Ghiat al-Din realized the natural advantages of the site: if the water could be contained, it could irrigate a large area immediately adjacent to the fortress; the water itself could serve as a vast moat to protect the fort. Whilst the purposes were multiple, and were part of grand strategies, techniques and designs were also diverse. The majority of the earliest Muslim dams were completed in Arabia itself; and full information on their height, length, and ratios between height and length is given by Schnitter. He notes that with the exception of the Qusaybah dam near Medina, a 30 m high-205 m long structure, which was slightly curved in plan, the alignment of all others were straight. About half such dams were provided with a flood overflow at one end, and often with a downstream training wall to guide the spilled water to a safe distance from the foot of the dam. Schnitter also observes that about a third of these very early dams (7th-8th century) are still intact. 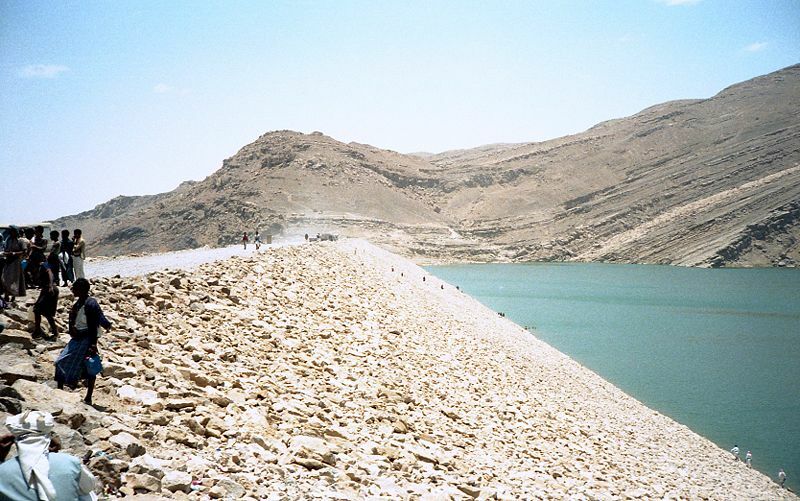 Figure 2a-b: Khaybar Dam called Sadd Qasr al-Bint in the Arabian peninsula. 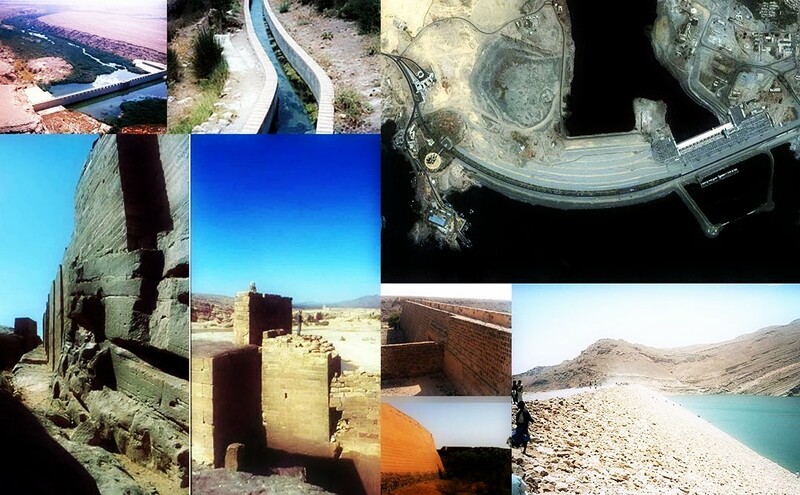 It is one of the largest ancient dams, probably built by the Queen of Sheeba in pre-Islamic times. It is a big stone construction on a dried out river bed. Although it had been breached for about one third of its length, it is nevertheless an impressive 20 metres high and about 135 metres long. The upstream face is plastered with yellow mortar, the downstream face with bare stone. (Source). This, and other major breakthroughs, such as the invention of payment by cheques and similar means, the erection of windmills, the building of new cities on the desert sands (such as Kufa, Basrah, Al Qayrawan…), the devising of maps, the unique military prowess in taming the two great empires of the time (Byzantium and Persia) and so on, wholly contradict the view held by many that Muslims only waited until they translated Greek works to begin their march towards civilization, and are, instead, testimonies to the central place taken by the faith in Islam greatness. Back to dams, subsequently, in Iraq, in the vicinity of Baghdad, a considerable number of dams were built during the Abbasid Caliphate. Most of the dams were on the Tigris, but a few are on water diversions, a further illustration of a high level of engineering skills. The Kebar dam, in Iran, dating from the 13th century, is the oldest arched dam known to have survived. The dam has a core of rubble masonry set in mortar, the mortar made from lime crushed with the ash of a local desert plant, the addition of the ash making the lime hydraulic. This results in a strong, hard and impervious mortar, ideal for dams and the reason for such dam’s long life, and the absence of cracks in it. Earlier, three dams were completed by King Mahmud of Ghaznah (998-1030) near his capital city. One named after him, was located 100 km SW of Kabul, and was 32m high, and 220m long. Dam construction in Muslim Spain was prolific. In the city of Cordoba, on the river Guadalquivir, can be found what is probably the oldest surviving Islamic dam in the country. According to the twelfth- century geographer al-Idrisi, it was built of Qibtiyya stone and incorporated marble pillars. The dam follows a zig­zag course across the river, a shape which indicates that the builders were aiming at a long crest in order to increase its overflow capacity. Remains of the dam can still be seen today, a few feet above the river bed, although in its prime, it was probably about seven or eight feet above high- water level and eight feet thick. Techniques used by Muslim masons and engineers reached great heights of ingenuity. On the river Turia, in the same country, modern measurements have shown that the eight canals have between them a total capacity slightly less than that of the river, thus raising the possibility that the Muslims were able to gauge a river and then design their dams and canals to match. Smith elaborates on Muslim construction skills. Muslim engineers used sophisticated land surveying methods to locate their dams in the most suitable sites, and also to lay out very complex canal systems. For such, they used astrolabes and also trigonometric calculations. The search for the lasting and solid remained central throughout. Around Baghdad water was diverted into the Nahwran Canal which supplied water for irrigation, whilst improvements were made to existing systems. Dams were built of carefully cut stone blocks, joined together by iron dowels, whilst the holes in which the dowels fitted were filled by pouring in molten lead. 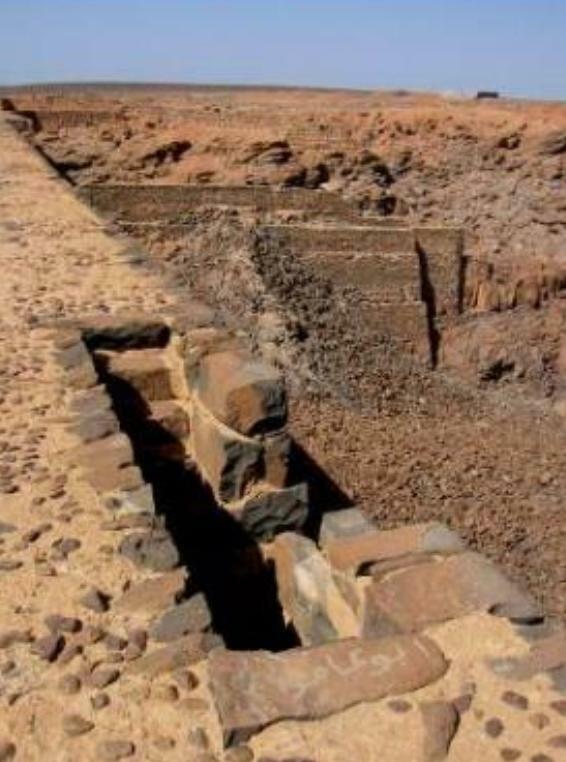 An impressive structure of masonry is Hill‘s description of the dam at Marib in Yemen, with its carefully cut and fitted blocks using lead dowels in their joints. It was 14 metres high and 600 metres long, with elaborate waterworks including sluices, spillways, a settling tank and distribution tank. So strong a structure it was, it survived for about ten centuries until lack of financial and technical resources made it impossible to maintain. Figure 3: View of the moder Marib dam in Yeman taken in 1986. The Marib dam blocks the Wadi Adhanah in the valley of Dhana in the Balaq Hills, Yemen. 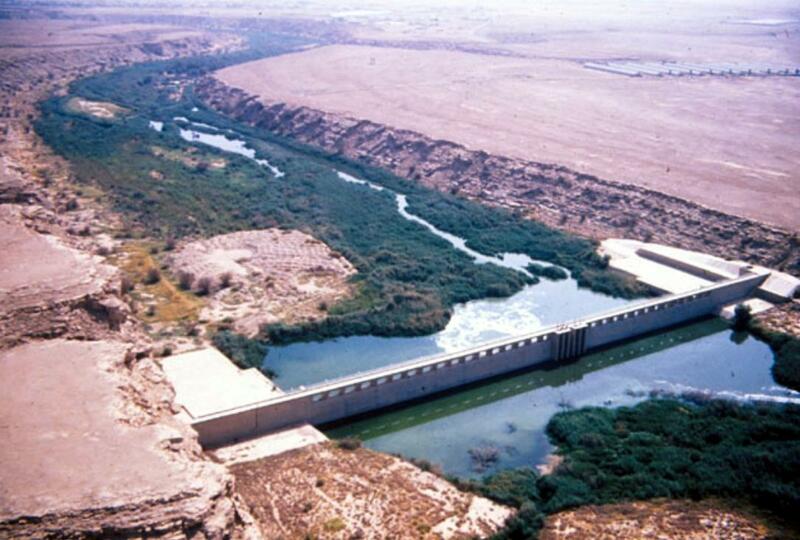 The current dam is close to the ruins of the Great Dam of Marib, dating from around the 7th century BCE. 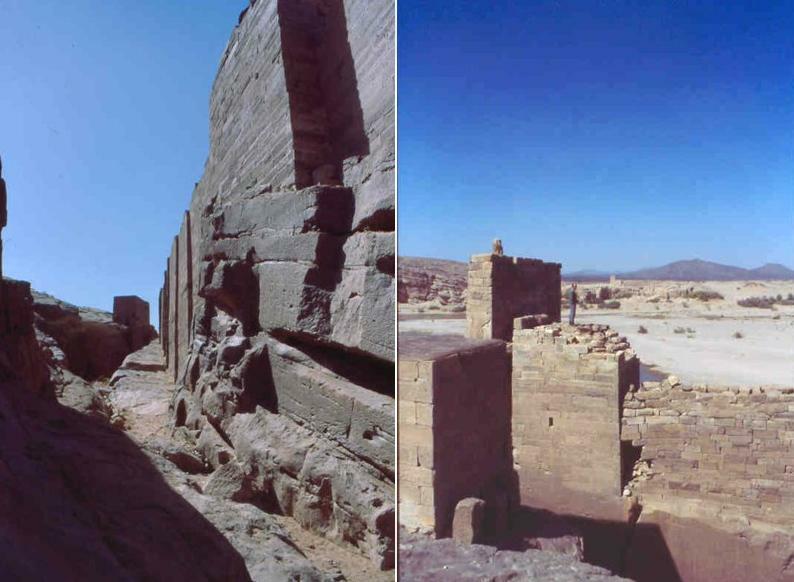 It was one of the engineering wonders of the ancient world and a central part of the south Arabian civilization around Marib. (Source). According to Scott, the masonry of the reservoirs in Spain was of the finest quality, and the cement used was harder than stone itself. Contingencies were provided for in such a manner that no overflow occurred, and no damage resulted even during the worst flooding. Evidence of Muslim engineering skills is the fact that these dams needed hardly any repair in a thousand years. At first sight, the eight dams on the Turia River seem to have an exaggerated amount of weight placed on their foundations, the masonry of each dam going some fifteen feet into the river bed, further support being provided by the addition of rows of wooden piles. Such solid foundations were justified by the river’s erratic behaviour, which in times of flooding reaches a flow that is a hundred times greater than normal, the structure having to resist the battering of water, stones, rocks and trees. These dams, now over ten century old, still continue to meet the irrigation needs of Valencia, requiring no addition to the system. On the River Segura, the Muslims built a dam in order to irrigate vast lands in the Murcia region. Because of the nature of the terrain, the location, design and construction had to be perfect. The height of the dam was only 25 feet, yet at its base its thickness was 150 and l25 feet, which may seem excessive. Such thickness was necessary to counteract the softness and weakness of the river bed and to prevent it from sliding along. The water flowing over the crest initially fell vertically through a height of 13-17 feet on to a level platform, running the length of the dam. This served to dissipate the energy of the water spilling over the crest. The over-flow then ran to the foot of the dam over flat or gently sloping sections of the face. In this way the whole dam acted as a spillway and the energy gained by the water in falling 25 feet was dissipated en route. Thus the risk of undermining the downstream foundations was greatly reduced. Like with other dams, rubble masonry and mortar were used for the interior, and the whole was finished with large masonry blocks. Approximately four kilometres to the west of the Quwwat al-Islam mosque in south Delhi is the village of Mahihpalpur, which flourished under Firuz Shah's patronage. The area showed agricultural potential, and the sultan, as at Hisar, evidently wanted to encourage settlement. He ordered construction of a 1.4 kilometre L-shaped masonry dam (bund), to the south of the village, to contain run-off from the hills to the east, and it was a remarkable enough structure that the chronicler, 'Afif, identifies it in his list of notable dams. Sluice-gates, technically similar to those at Tughlu-qabad, were located at the northern and southern ends of the dam in order to control water-flow from the artificial lake on the east to the fertile farmland on the west that must have been criss-crossed by an extensive irrigation system. The dam is about 3.5 metres above the present ground level, and the artificial lake must have been of substantial size and depth immediately after the rains. A number of stairways on the east side provided access to the top of the dam. The lake and abundant vegetation around it attracted wildlife, and the sultan was a passionate hunter: to the north in the present-day village is a small mahal that may have served as a kushk-i shikar (hunting lodge) for the sultan. By far, the most original Muslim reservoirs are to be found in the region of Qayrawan in Tunisia. A lengthy account of these structures is offered by the French scholar Solignac. Possibly on aesthetic grounds, and like many other Islamic achievements, and despite all evidence to the contrary, these reservoirs were attributed, to both Phoenicians and Romans. These views were adopted by a number of scholars until modern archaeological excavations and advanced studies proved the Islamic origin of such structures. The reservoirs have two basins, one used for decantation, one as a reserve, and at times a third one for drawing water out of it. Other than their impressive numbers, over two hundred and fifty in the region, such reservoirs also offer a great attraction in their form and structure. The contribution of Muslim India (which at the time included modern day Pakistan and Bangladesh) to civilisation and technology is hardly known. Most of the focus has been placed on Iraq and al Andalus, and other places such as Syria and Egypt to some extent. We hardly, if at all, find any reference to the Muslim role in India except the Moghul Dynasty between the 16th and 18th centuries. It is as if the rest of Muslim history in India was a barren period, devoid of any accomplishment of worth. Once more this is primarily the result of Muslim (with some exceptions such as S.M. Ikram), lack of scholarly vigour in bringing to knowledge what constituted one of the great pages of Islamic civilization, that is the period of between the 12th and 14th century. So many accomplishments were made there during the so-called Turkish dynasties or the Delhi Sultanate. It is not the scope of this article to dwell on this subject, focusing instead on hydraulic engineering, dam construction in particular. The reason for this focus on this matter here is not only to cover a huge gap in knowledge of the subject, but also to show that dam construction in India and related technology were perhaps the most sophisticated of the whole Muslim world, and some of the most sophisticated in human civilization. In this respect, the works by the scholar, Antony Welch, are of the highest standards, Welch focusing on Tughluq works in the field, showing not only how the Tughluqs excelled at the construction of such dams, but also their far reaching thinking in completely transforming the landscape for the better, including their acute awareness of, and love for, a world of greenery that could be achieved through engineering works of, at times, quite gigantic scale. The Tughluq Dynasty owes its origins to Ghiat Eddin Tughluq, who became Sultan of Delhi in September 1320; he was the son of a Turkish slave of Balban (a former ruler) and a Jat woman. This Dynasty lasted for nearly a century until it was terminated by Timur the Lame who devastated India in 1398, and hence ended its existence. During the period of Tughluq ascendancy, many dams and reservoirs were completed as seen to some extent already. The elaborate system of dams Ghiat al Din built was integral to Tughluqabad's defenses: the dams doubled as walls, while the lake they contained made access from the level land on the south side difficult. They also were the key element in what was obviously an elaborate agricultural project designed to transform the usually arid area around Tughluqabad into flourishing farmland. Within Tughluqabad itself, immediately to the northwest of the main gate is a massive, square reservoir, while within the city's walls at least two cisterns and six wells have been identified. With this massive public works project Ghiat al-Din evidently hoped to establish a new capital region to the south of the earlier centre of power around the Mu'izzi jami', a testimony to a grand vision. Under Firuz (1351-1388), engineering works, especially dams and canals, as well as the foundation of new cities, reached heights little experienced anywhere else in history for their numbers, scale and sophistication. During this sultan’s rule no less than 200 towns were founded, together with 40 mosques, 30 colleges, 30 reservoirs, 100 hospitals, 100 public baths, and 150 bridges, besides a whole new capital near Delhi being built. He established a sizeable administrative structure for supervising his architectural projects, which also included forts; caravanserais; and a great variety of waterworks, including wells, cisterns, dams and sluice-gates, canals, and reservoirs; and the restoration of buildings constructed by his Muslim predecessors. The sultan considered hydraulic architecture and the transformation of land through water to be a pious duty incumbent upon a Muslim ruler. The Hauz Khas madrasa that includes the tomb of Firuz Shah within its walls is in modern Delhi an oasis of quiet and sheltered green. In the northern part of south Delhi, it lies closer to the Quwwat al-Islam Mosque and was the site of a large reservoir excavated by the Khalji sultan 'Ala al-Din (1296-1316) for the use of the people of Siri, his capital city. By the reign of Sultan Firuz it had fallen into disuse and was badly in need of repairs. In keeping with his conscientious attention to restoring the works of his predecessors, the king in 1352, re-dug and enlarged the reservoir and made it usable again. At the end of the monsoon a vast shallow lake filled the site. Along its south and east sides he began an extensive building program that may have continued until 1388. When completed, the madrasa at the Hauz Khas was one of the largest in the Islamic world and the most important center of intellectual activity in late 14th century Delhi. The complex served as the center of a new community, and population rapidly increased in size around it. Because this madrasa is a monument of good works and public benefaction, prayers, obligatory and superogatory, are constantly offered within its precincts..."
Sums up his lifetime of building. In style it was inventive and eclectic. It transformed a side and the area around it and created fertility where there had been none. It served to promote both agriculture and pious learning. The waters of the reservoir fed the gardens in and around the madrasa, and cool air from the lake blew through the pillared halls on its shores. A modest cubic building on a small hill may have been an island pavilion, and the reservoir's banks must have teemed with the animals the sultan loved to hunt. The sultan's own tomb was wafted too by breezes from the lake and odors from the garden, while its residents offered up prayers for his salvation. Its combination of piety and utility is as much a hallmark of his reign as is its careful planning and thoughtful experimentation. Among the dynasty's water projects it is at once both the simplest and the most elegant." The sultan was not only a great builder but a devout gardener, too, having so many of them all over Delhi planted with all sorts of trees, and yielding funds for the treasury. None of the sultan's gardens has survived, though the contemporary, 'Afif, reports that he laid out 1,200 in the Delhi area alone. Some of these may have been simply repaired and replanted during his reign, for 'Afif specifically mentions thirty gardens that 'Ala al-Din Khalji (r. 695-715 H./1296-1316 CE.) had begun but that Sultan Firuz finished. Bolens reminds us that water management in all its intricacies, from Andalusia to Afghanistan, was the basis of agriculture, and source of all life. All the Kitab al-Filahat (books of agriculture), whatever their origin, Maghribian, Andalusian; Egyptian, Iraqi, Persian or Yemenite, meticulously insist, on the deployment of equipment and on the control of water. The authorities of the time played a crucial role in that, too. In Iraq, as a rule, hydraulic tasks of a vast nature were left to the state, while the local population focused its efforts on lesser ones. In Egypt, a more complex picture emerges. There, the management of The Nile waters was crucial to every single aspect of life, and dams responded to such necessity. Both al-Nuwayri and al-Makrizi stressed the role of maintenance of dams and waterways of the Nile for maximum benefits. It was the responsibility for both sultans and holders of large holdings, under both Ayyubids and Mamluks, to dig and clean canals and maintain dams. As in Iraq the sultan took over the larger structures, and the people the lesser ones. Most distinguished emirs and officials were also made chief supervisors of such works. Under the Mamluks there was even an officer for the inspection of dams for each province of Egypt: the Kashif al-Djusur. Canavas remarks that the “superintendent of irrigation” of Merv in the 10th century was said to have more power than the prefect of the city since he commanded some 10000 workers to build and maintain irrigation canals and dams, and a series of 10 norias and attached mills. Firuz 's effort in canal-diggings, the numerous gardens built on his order, and reservoirs in the area of Delhi received the approval of the 'Ulama in respect to the instituting a water tax of 10% on the increased production made possible by his works. Dams are used to store water, and this has major implications on economic and social life. Smith observes that ‘not only do dams represent some of the most impressive achievements of engineers over the centuries, but their vital role in supplying water to towns and cities, irrigating dry lands, providing a source of power and controlling floods is more than sufficient to rank dam building amongst the most essential aspects of man’s attempt to harness, control and improve his environment.’ Challenges, natural or others, can become sources of a great innovative spirit. Control of water was and is a central problem in northern India. The major monsoon brings vast amounts of water in a relatively short period between late June and early September, and, except for a minor monsoon in the winter months, this deluge of precipitation is the main source of water other than the rivers of north India. This presents two problem: buildings must be designed to withstand the monsoon, and structures must be built to contain as much water as possible to sustain life during the long dry season. Effective storage and use of water for irrigation, for instance, can have dramatic repercussions, in cheapening the process and bringing into use lands that were hitherto impossible or uneconomic to irrigate. Both Spain and Sicily offer good illustrations of that. Water is also stored for the aim of providing power for milling. In Khuzistan, at the Pul-I-Bulaiti dam on the Ab-i-Gargar, the mills were installed in tunnels cut through the rock at each side of the channel, constituting one of the earliest examples of hydro-power dams, and not the only one in the Muslim world. Another example is the bridge-dam at Dizful, which was used to provide power to operate a noria that was fifty cubits in diameter, which supplied all the houses of the town. In Muslim India, Ghiat Eddin Tughluq, for instance, passed measures aiming at extending the area under cultivation, knowing that farmers ought not be driven into despair and rebellion by excessive demands, and that the surest means for increasing the revenue was by extending the area under cultivation and not by raising tax demands. This policy resulted in the reclaiming of much wasteland and the extension of the surface under cultivation. Many ruined villages were repopulated; canals were dug for irrigation and gardens multiplied. Irrigated surfaces expanded vastly under Firuz, and in many places two harvests were obtained instead of one. The process of canal-digging is referred to in 'Afif's description of the creation of the city of Hisar over a period of two-and-a-half years. The region appealed to sultan Firuz, and it was strategic, controlling trade from Khurasan and providing a major line of defense for Delhi and the rest of northern India. He determined to build a city that would attract a large population. In the great fort at the city's center was constructed a large, deep tank: it served not only to supply the fort's inhabitants with water but also to keep the moat filled that surrounded the fort. Since the city had too little natural water to support a large population, the sultan had five large canals constructed, the most important carried the waters of the Yamuna to the city of Hisar, and was 150 miles long, whilst another was 96 miles long, running from the Satluj to the Ghagara. A large area of land covering over 160 miles was supplied, and in the Doab alone there sprung up 52 new colonies as a result of such works. The management of the canals was entrusted to skilled engineers who ascertained their good functioning condition. The abundant water made two harvests a year possible and established Hisar as the capital of the region. The Islamic mastery of hydraulic technology is far more advanced than acknowledged by some of the sources many are too keen to follow, and which hence distorts the exact role of Muslim engineering skills. Indeed, to the likes of Gimpel and White, the Muslims hardly made any contributions in such a field. Reality, however, is far the opposite. First and foremost, the hydraulic works of the Ancients were found by the Muslims in a state of decay and ruin, and they did not just repair them, but also added considerable skills of their own. 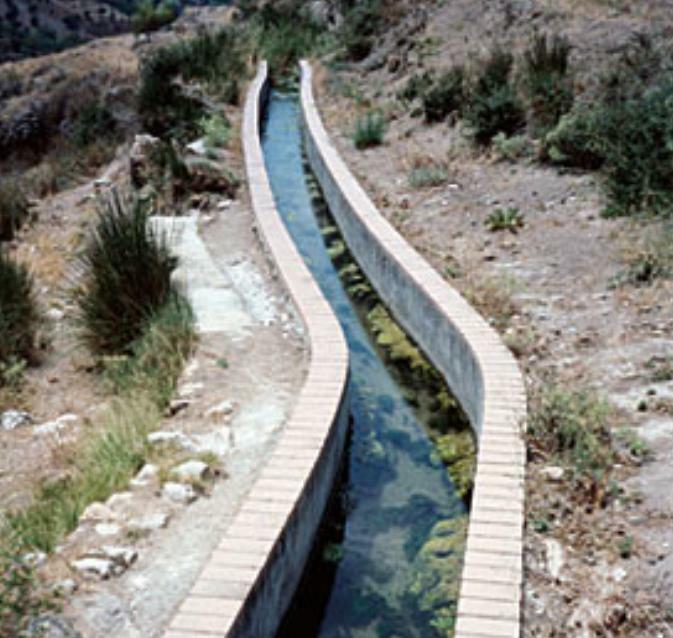 Figure 6: An acequia flowing toward Granada from the spring in the village of Alfucar in the foothills of the Sierra Nevada, was first built in the 13th century and is still flowing today. (Source). To Spain, for instance, the Muslims brought irrigation techniques which not only laid the foundations for the prosperity of the country, but also with nothing as elaborate and as efficient seen before in Europe. After the country was retaken by Christian forces, the Muslims, masters of great skills then, were allowed to retain their functions and serve the new crown. Alongside builders, paper and textile makers, manufacturers of iron and experts of all sorts, the Spaniards also retained and used Muslim irrigation works, their attendant rules and even regulations. Hill also notes that the introduction of desilting sluices, the arch dam, and hydropower made their first appearances in the Islamic world, observing that it is ‘difficult to see how these can be other than Muslim inventions.’ As Edmund Burke iii notes, Middle Eastern water management technology spread wide and Islamic hydraulic engineering knowledge was also vital in shaping the environment of early modern Europe. Mark Cioc has noted that the two main centers of hydraulic knowledge in early modern Europe were Venice and the Low Countries. The hydraulic engineering prowess of both, he suggests, while indebted to Roman and indigenous precedents (notably polder construction) also drew heavily upon the water management technological package that had been assembled under Islamic auspices. The dyking of the Dutch coast and inland marshes as well as the damming of the Rhine and the Po river systems owed much to this source. Islamic hydraulic technology was taken by the Spaniards to the Americas and Mexico. Glick has even traced an Islamic origin to the water systems of San Antonio and the southwestern United States. More recently Mesoamerican archeologists have finally had to concede that both Mexican galleries and Peruvian puquios were derived from qanat technology imported by the Spanish. Islamic societies played a central role in the assembly and diffusion of the water management technological complex within Afro-eurasia prior to 1250 c.e. The pragmatic ecumenism of Muslim engineers and agronomists, officials and farmers set the model for what came next." Further illustration of Islamic impact in the field is not just obvious through the works of Hill, Pacey, Smith and others, it is also visible via the works of Muslim engineers themselves as can still be observed through the remains of old age storage structures all over the Islamic land. Furthermore, White’s, Gimpel’s and their followers’ argument lacks historical backing, for the major changes that took place in Europe, and not just in terms of hydraulic technology, but all others, too, occurred at the time the Europeans came into contact with the flourishing Islamic civilisation (twelfth-thirteenth centuries), and not the centuries before. Also, the fact that medieval Western technology is identical to the Islamic one in many respects offers further evidence of such an impact. Like with much else regarding Islamic civilization, dams and other hydraulic structures suffered destruction on the hands of the Mongol invaders. Between 1218-1222, the armies of Genghis Khan devastated the whole eastern parts of the Muslim land. The destruction of al-Jurjaniyah dam south of the Aral Sea diverted the River Oxus from its course and deprived the Aral Sea of water, causing it to nearly dry out centuries later. A hundred and sixty three years later, in 1383, it was Timur’s hordes, which this time completed the work of their predecessors. The Tartars laid the land waste, Zaranj the capital of the province of Seistan, suffering terrible fate; its dams and all its irrigation works completely laid waste. A similar fate befell the Band-I-Rustam, and the region of Bust. Today, hardly anything survives in those lands once the seats of great civil engineering accomplishments. In Muslim India, whose great engineering works have been described in detail, the passage of Timur signaled the descent into a period of great decline. He slew and destroyed so much that the consequences of his passage remained visible for decades, centuries even. On the last day of 1398, he resumed his march back to his capital; first offering a 'sincere and humble tribute of grateful praise' to God. Timur then crossed the Ganges, and proceeded to commit more massacres (1399). So complete was the desolation of the country and its capital that those of the inhabitants who survived the massacres died from hunger and disease, while for two whole months ‘not a bird moved wing in Delhi.’ Wherever Timur’s army had trampled, from the Indus to the Ganges, over the whole of the Punjab, desolation and famine were left behind. Lucie Bolens: Irrigation: in Encyclopedia of the history of Science, technology, and Medicine in Non Western Cultures. Editor: Helaine Selin; Kluwer Academic Publishers. Dordrecht/Boston/London, 1997; pp. 450-2. L. Bolens: L'Eau et l'Irrigation d'apres les traites d'agronomie Andalus au Moyen Age (XI-XIIem siecles), Options Mediterraneenes, 16 (Dec, 1972). C. Cahen: Irrigation in Iraq; Encyclopedia of Islam, second edition, vol v, Leiden, Brill, pp. 864-5. J. Gimpel: The Medieval Machine, Pimlico, London, 1976. T. Glick: Irrigation and Society in Medieval Valencia (Cambridge; 1970). D.R. Hill: Islamic science and engineering, Edinburgh University Press, 1993. Le Strange: The Lands of the Eastern Caliphate, London, 1905. A. Pacey: Technology in World Civilization, a Thousand year History, The MIT Press, Cambridge, 1990. H. Rabie: Pre-20th century irrigation in Egypt, in Encyclopedia of Islam, vol v, pp. 862-4. N.J. Schnitter: A History of dams; A.A. Balkema, Rotterdam, 1994. A. Solignac: Recherches sur les installations hydrauliques de Kairaouan et des Steppes Tunisiennes du VII au Xiem siecle, in Annales de l‘Institut des Etudes Orientales, Algiers, X (1952); 5-273. A.M. Watson: Agricultural innovation in the early Islamic world, Cambridge University Press; 1983. Lynn White Jr: Medieval Technology and Social Change, Oxford, 1964. T. Yamamoto, M. Ara, and T. Tsukinowa, Delhi: Architectural Remains of the Sultanate Period. (Tokyo Daigaku, Indo Shiseki Chosa Dan, Deri shooco jidai no kenzobutzu no kenkyu, Tokyo, Indo Shiseki Chose Dan hen, 1968-1970). A. Pacey: Technology in World Civilization, a Thousand year History, The MIT Press, Cambridge, 1990, at p. 8. - E.J. Holmyard: Chemistry in Islam, in Toward Modern Science, vol 1, R. Palter edition, The Noonday Press, New York, 1961; pp. 160-70. - J.H. Harvey: the origins of Gothic Architecture, Antiquaries Journal, 48, pp. 87-99. And anyone taking the bother to read any of the many books or articles devoted to Islamic science that are still accessible, will find support for the opinion of neglect and cover up of the Muslim contribution to world civilization. Welch, Antony. "Hydraulic Architecture in Medieval India: The Tughluqs;” in Environmental Design: Journal of the Islamic Environmental Design Research Centre 2, edited by Attilo Petruccioli, Rome: Carucci Editions, 1985, pp. 74-81, at p. 75. Shams-i Siraj 'Afif: Tarikh i Firuz Shahi, in H. M. Elliot & J. Dowson, The History of India as told by its Own Historians, 8 vols. Allahabad, n.d., vol. Ill, p. 382. Welch, Antony. "Hydraulic Architecture in Medieval India: The Tughluqs;” op cit; p. 75. N.J. Schnitter: A History of dams; A.A. Balkema, Rotterdam, 1994; pp. 81-2. G.W. Heck: Charlemagne, Muhammad, and the Arab Roots of Capitalism. Berlin and New York: Walter de Gruyter, 2006. J. Lyons: The House of Wisdom: How the Arabs Transformed Western Civilization. London: Bloomsbury, 2009. H.R. Turner: Science in Medieval Islam, Austin Texas, 1997. A.M. Watson: Agricultural Innovation in the Early Islamic World; Cambridge University Press; 1983. E. Wiedemann: ’Zur mechanik und technik bei der Arabern' in Sitzungsherichte der Physikalisch-Medizinischen Sorietat in Erlangen (38), 1906. N. Smith: A History of Dams, op cit, p. 78. D.R. Hill: Islamic science and engineering, Edinburgh University Press, 1993, p. 168. N. Schnitter: A History, op cit, pp. 88-9. T. Yamamoto, M. Ara, and T. Tsukinowa, Delhi: Architectural Remains of the Sultanate Period. (Tokyo Daigaku, Indo Shiseki Chosa Dan, Deri shooco jidai no kenzobutzu no kenkyu, Tokyo, Indo Shiseki Chose Dan hen, 1968-1970); vol 3; pp. 52-4. N. Smith: A History, op cit, p. 90. N. Smith: a History, op cit, p. 88. See forthcoming chapter on al-Battani. A. Pacey, Technology, op cit, p.9. D. Hill: Islamic Science, op cit, at p. 159. S.P. Scott, History of the Moorish Empire in Europe; J.B. Lippincott Company, London and Philadelphia, 3 vols, vol 3, 1904; at pp. 601-2. N. Smith: A History, op cit, pp. 94-7; D. Hill: Islamic science, op cit, pp. 166-7. Welch, Antony. "Hydraulic Architecture in Medieval India: The Tughluqs;” op cit; p. 79. Antony Welch and Howard Crane, The Tughluqs: Master Builders of the Delhi Sultanate, in: O. Grabar (ed.) ‘Muqarnas», vol. I (1983), p. 154. Afif 354; yamamoto et al; op cit; vol 3; pp. 77-81. A. Solignac: Recherches sur les installations hydrauliques de kairaouan et des Steppes Tunisiennes du VII au Xiem siecle, in Annales de l’Institut des Etudes Orientales, Algiers, X (1952); 5-273. A list that includes Arabic numerals, the invention of the pendulum, the use of the compass in navigation, the vaulted arch in construction, blood circulation, and so on and so forth, all attributed to various sources other than Islam despite all evidence in favour of the Muslims. On the other hand, acts such as the burning of the famed Library of Alexandria were attributed for centuries to the Muslims despite the flimsy nature of evidence. The library was proven to have been burnt centuries before the Muslims entered Egypt (See E. Gibbon, The decline and Fall of the Roman Empire, for instance.) Undaunted, some sources still ignore such evidence and keep blaming the Muslims. A. Daux: Recherches sur l’originalite et l’emplacement des emporia Pheniciennes dans le Zeugis et le Byzacium, Paris, 1849. H. . Saladdin: Enquetes sur les installations hydrauliques romaines en Tunisie, published by Direction des Antiquites et Beaux Arts, et La regence de Tunisie, Tunis, 1890 a 1912. R. Thouvenot: Les traveaux hydrauliques des Romains en Afrique du Nord in: Realites marocaines, Hydraulique, Electricite, Casablanca, 1951. S.M. Ikram: Muslim Civilisation in India; ed., by A.T. Embree; Columbia University Press; New York; 1964; p. 70. S.M. Ikram: Muslim Civilisation in India; op cit; pp. 74-5. Welch, Antony. "Hydraulic Architecture in Medieval India: The Tughluqs;” op cit; p. 76. A. Welch and H. Crane, op. cit., pp. 140 & 146. A. Welch was then completing a detailed study of this major religious center. Welch, Antony. "Hydraulic Architecture in Medieval India: the Tughluqs;” op cit; p. 81. K. A. Nizami, A Medieval Indian Madrasah, in idem, ed., «Studies in· Medieval India History and Culture» Allahabad, 1966, pp. 78-9. S. Lane Poole: Medieval India; op cit; p. 146. Welch, Antony. "Hydraulic Architecture in Medieval India: The Tughluqs;” op cit; p. 78. Lucie Bolens: Irrigation: in Encyclopedia of the history of Science, technology, and Medicine in Non Western Cultures. Editor: Helaine Selin; Kluwer Academic Publishers. Dordrecht/Boston/London, 1997; pp. 450-2; at p. 451. H. Rabie: pre-20thcentury irrigation in Egypt, in Encyclopedia of Islam, vol v, pp. 862-4. Al-Nuwayri: Nihayat al-Arab, Cairo, 1923, vol I, p. 265. Encyclopedia, op cit, p. 862. Ibn Hawqal, 1938. Kitab Nihayat al Arab. Arabic text ed. J. H. Kramers, 2nd ed. of vol. 2 of BGA. Leiden: Brill; pp. 635-636. D.R. Hill: A History of Engineering in Classical and Medieval Times. London/New York: Routledge; p. 25. N. Smith: A History, op cit, preface, p. i.
 Welch, Antony. "Hydraulic Architecture in Medieval India: The Tughluqs,” op cit, at p. 74. A.M. Watson: Agricultural innovation in the early Islamic world, Cambridge University Press; 1983; p. 104. N. Smith: A History, op cit, p. 81. Le Strange: The Lands of the Eastern Caliphate, London, 1905; p. 239. A. Laljjrivastava: The Sultanate of Delhi; Shiva Lal Agarwala Publishers; Agra; 1950; p. 184. S. Lane Poole: Medieval India; Putnam’s Sons; New York; 1903; p. 146. A. Laljjrivastava: The Sultanate of Delhi; op cit; p. 211. Jean Gimpel: The Medieval machine, Pimlico, London, 1976. When C. Singer, assisted by Hall and Holmyard completed the edition of the large ‘History of Technology’, in five volumes, in 1958, the response from Lynn White was vitriolic towards the epilogue written by Singer ‘East and West in Retrospect’. White used first Speculum (vol 33, 1958, pp. 130-5,) and, above all Technology and Culture (Vol 1, 1958, at pp. 340-1), a quarterly set up soon after Singer’s book, and with him (White) taking one of the leading positions in that journal, to attack Singer‘s above quoted chapter. Singer is not the first recipient of such attacks, though. Books or journals, including the famed ISIS (founded by George Sarton,) that is deemed favourable to Islamic science and technology suffers the same onslaught. D.R. Hill: Islamic science, op cit, at p. 161. N. Smith, A history, op cit, p. 103. D.R. Hill: Islamic science, op cit, pp. 168-9. Edmund Burke iii: Islam at the Center: Technological Complexes and the Roots of Modernity; Journal of World History, Vol. 20, No. 2; University of Hawaii Press; 2009; pp. 165-186. Mark Cioc, “The Rhine as a World River,” in The Environment and World History, 1500–2000, by E. Burke III and K. Pomeranz (Berkeley: University of California Press, forthcoming). E. Burke iii: Islam at the Center; op cit; p. 174. H. F. M. van de Ven, ed., Hydrology for the Water Management of Large River Basins (Wallingford, United Kingdom: International Association of Hydrological Sciences, 1991); Johan Van Veen, Drain, Dredge, Reclaim: The Art of a Nation (The Hague: Martinus Nijoff, 1962). Thomas F. Glick, The Old World Background of the Irrigation System of San Antonio, Texas, Southwestern Studies Monograph No. 35. (San Antonio: Texas Western Press, 1972), pp. 3– 67. Monica Barnes and David Fleming, “Filtration Gallery Irrigation in the Spanish New World,” Latin American Antiquity 2 (1991): 46 – 68. E. Burke iii: Islam at the Center; op cit; p. 175. Including paper making, new architectural techniques, university teaching, the construction of hospitals, windmills, the use of the compass etc. N. Smith, a History, op cit, p. 86. W.W. Hunter: A Brief History of the Indian People; Oxford at the Clarendon, 1893; p. 126. W. Haig: The Reign of Firuz Tughluk, the Decline and extinction of the Dynasty, and the Invasion of India by Timur; in The Cambridge History of India, edited by Lt Colonel Sir Wolseley Haig; Cambridge University Press, 1928, vol 3; pp. 173-205; p. 201. S. Lane Poole: Medieval India; op cit; p. 160.